MUFF WIGGLER :: View topic - Bipolar CV and device with single sided supply? Bipolar CV and device with single sided supply? I have a desktop device that runs off a single sided supply. I would like to replace a resistor with a vactrol circuit, to gain CV control, which is itself relatively straightforward. However, I would ideally like allow for a bipolar CV, that is summed with a positive offset knob. The Music Thing spring reverb implements such as circuit, attached below. The issue is that the op-amps would require both positive and negative supply rails, which isn't available inside the device. 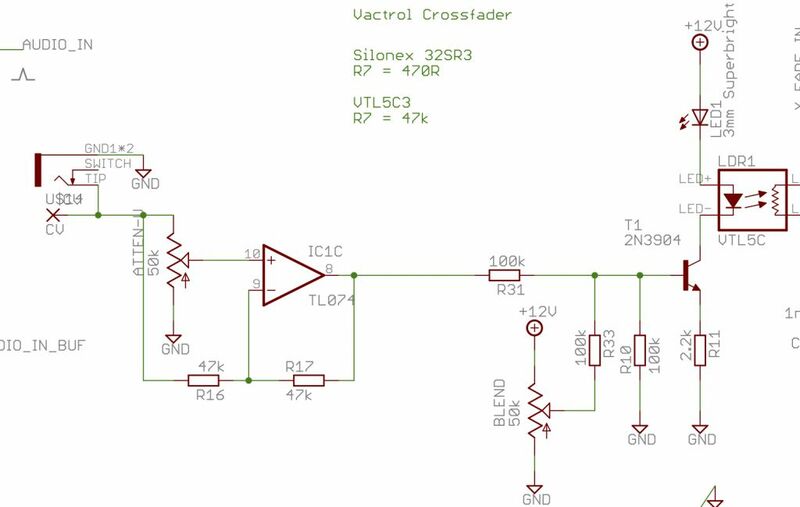 Should it be possible to allow a negative CV into a device with a single supply (such that the negative CV modulates the offset knob position)? For example by generating a virtual ground or other method? virtual ground will only work if you are working with AC coupled inputs (such as for audio). You could get away with using a switching supply to get a negative voltage to parts of the circuit but afaik there isn't really a way to do this. Of course someone smarter than me can feel free to correct me. i think you should be able to do that, as long as nothing after the opamp needs a negative voltage. do you want the attenuverter capability? id have to think for a bit on how to do that, but otherwise just use an inverting, summing amplifier, biased up to midrail. since it is biased to half the supply voltage, you can sum in voltages above or below that to make the output go higher or lower. If you use an op amp with rail-to-rail inputs (i.e. not a TL074...) with a single supply and a non-inverting summing circuit, it should work correctly as long as the sum is positive, and with a protective diode on the input it should also be okay, only clipping, in the case of a negative sum. The attenuverter isn't crucial, since I could easily implement a simple attenuator in its place. Thanks for the tip, I'll probably try to breadboard this and play around with it. I may also look at generating a negative supply incase I want to add other mods as well.